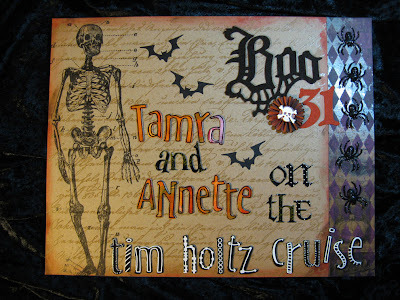 After about a little less than a year since we booked, the wait is finally over and I'll be hopping on the cruise ship tomorrow with five of my gal pals for a week of creative fun with Tim Holtz! 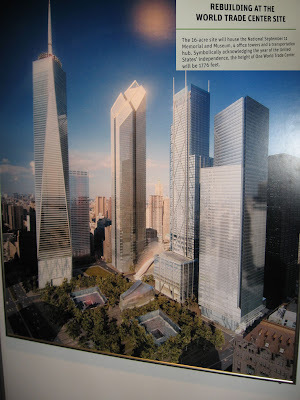 I had high hopes of pre-posting some blog entries, but simply ran out of time. I'll be back October 2nd and will be posting all kinds of photos from the cruise, so be sure to come back and check it out. 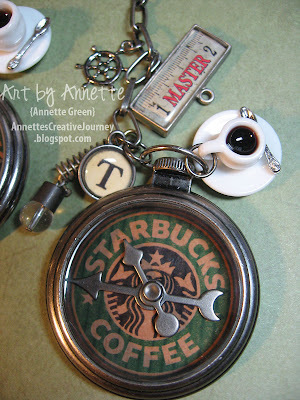 Meanwhile, here is a photo of the ATC's I finally finished, but still need to bag up. And here is our magnetic sign for our cabin door. Well, it's getting late and I still need to polish my toes pretty for Tim. Goodnight, and I'll see you upon my return! Linda will receive a goody box with two of my favorite Kits of the Month, some chipboard shapes, a few handmade items, a stamp set and a few other surprises! So congrats to Linda! Celebrating over 300 Followers with a Give-Away! Thank you for all your nice comments and for everyone's wonderful comments over the past couple of years. 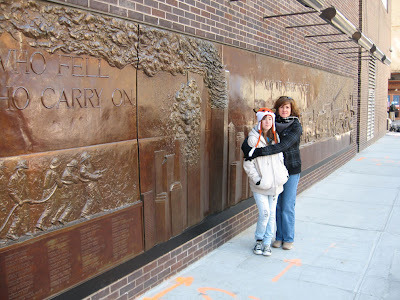 It's hard to believe I've been blogging a couple years already! 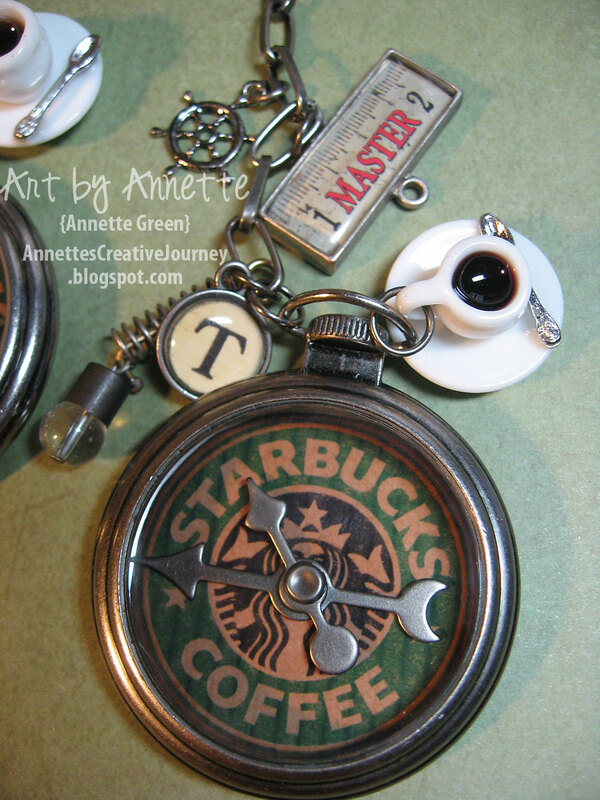 I love it, and I love visiting your blogs as well. The world is so much smaller when we connect this way and I find that very exciting. 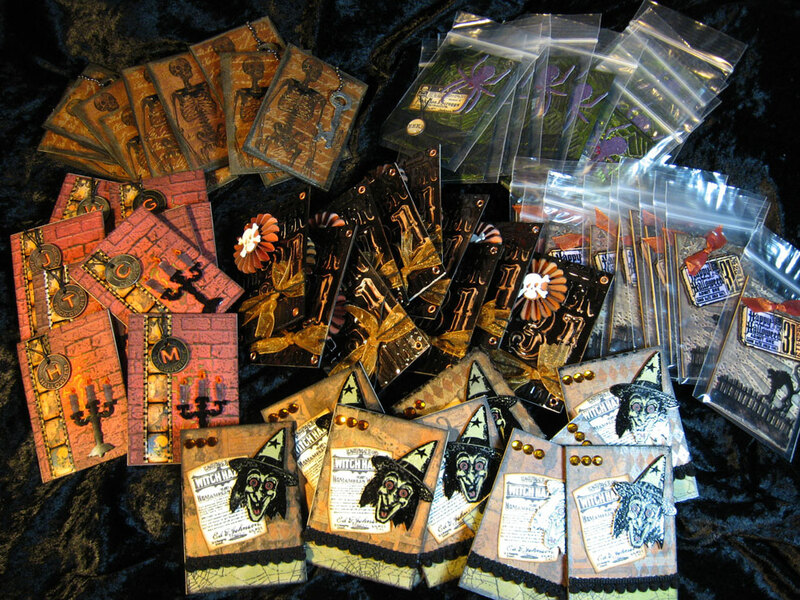 And speaking of exciting: To celebrate 300+ Followers, I am itching to give-away some goodies! How to win? Simply leave me a comment today or tomorrow (Tuesday or Wednesday) about what you enjoy most about my blog specifically and I'll pool all those comments and pull a winner. 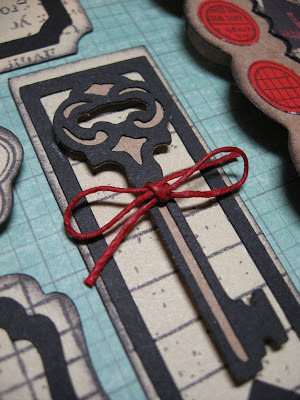 Please be specific too, because I'd really like to know... Is it the Tim Holtz projects I make? Is it the Close To My Heart projects? Is it the step-by-step photos, is it simply the inspiration? Is it for the stimulating reading material? (wink) Educate me with your feedback. While you do that, I'll be here in my studio getting more things ready for the upcoming Tim Holtz cruise (this Sunday! I'm ready to burst!) I leave you with a photo of something fun I made for the "Master" himself. (I made one for Mario too, shhhh.) Enjoy your day and thank you again for stopping by. Something about getting down to the wire that really motivates me and gets my creative juices flowing. 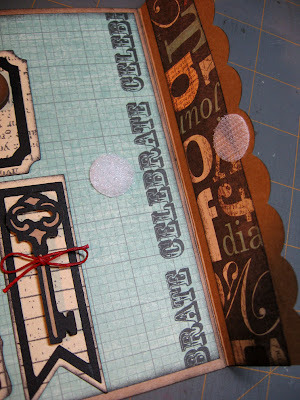 We leave for the Tim Holtz Crafting Cruise this Sunday and I am just now starting my ATCs. (Artist Trading Cards) I will be swapping with other cruisers and hope to collect lots of great inspirational cards to share with you. It's a lot like trading baseball cards, only Tim Holtz themed. What could be better? 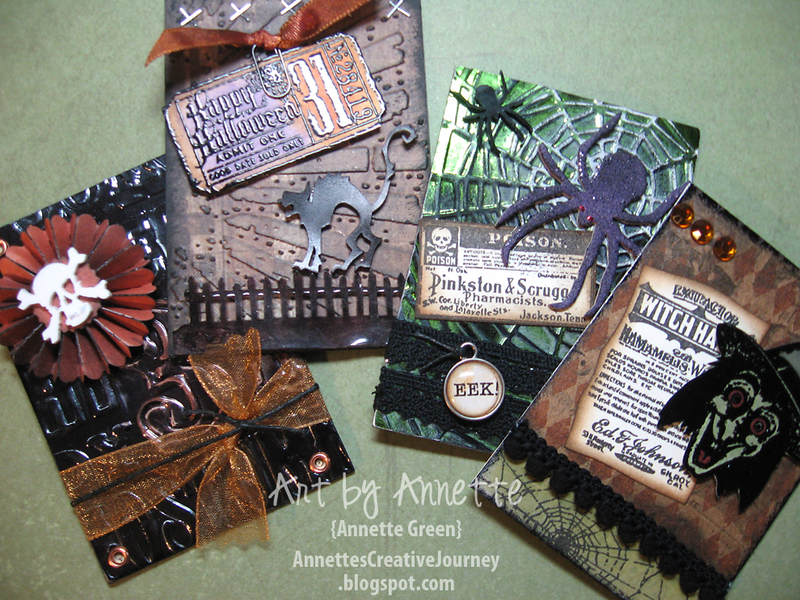 I got my hot little hands on some of Tim's newest Halloween papers and Alterations dies and Texture Fades, and with the help of Shrinky Dinks (shrink plastic) I am having a blast creating these fun little cards. They measure only 2 1/2 x 3 1/2 inches. Baseball card size. Off I go to make more. Stay tuned! Every month I open my home to croppers for free so they can come and get caught up on their scrapbooking, enjoy friendship and fun. Twice a year I host a large crop event, usually held at a local hotel or community center. Unlike my free monthly crop, this is a big deal. Lots of artwork displays, prizes, music, food and gifts. It's always a big hit. I've had many requests for a full weekend crop, and have beeb considering it. Then I learned one of my creative friends is also a certified travel agent and she suggested I try a cruise for my next big crop. At first I didn't think it would float (sorry) but to my surprise after sending out an interest survey I got tremendous response! So here we go. My first Create, Crop & Cruise! while cabins are available with a deposit of at least $25 per person by September 29th. 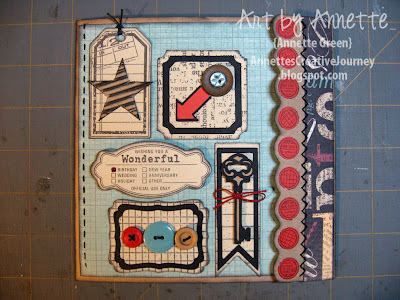 Unlimited scrapbooking time with plenty of space to create. Cruiser's goody-bag filled with surprises. Refreshments, music and lots of inspirational artwork on display. Cropping supplies & kits available for purchase. 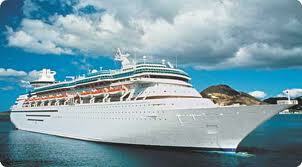 Payment for cruise and crop will be handled separately. Now is the time to book to ensure the best price and to hold your space, since seating will be limited. Contact me today for your official Create, Crop & Cruise contract. for this price and are included in the crop event. Husbands and any other family members are welcome, even if they don't attend the crop. So contact me today and let's set sail together! Inspired recently by a design in Paper Crafts Magazine (Sept/Oct 2011, page 56) I designed a card using the Art Philosophy Cricut cartridge and Typeset papers from Close To My Heart. The card started off with a plain Kraft cardstock card. These are CTMH's new Kraft Die-Cut Cards and Envelopes measuring 6 x 6 inches. I see so many design possibilities for these! 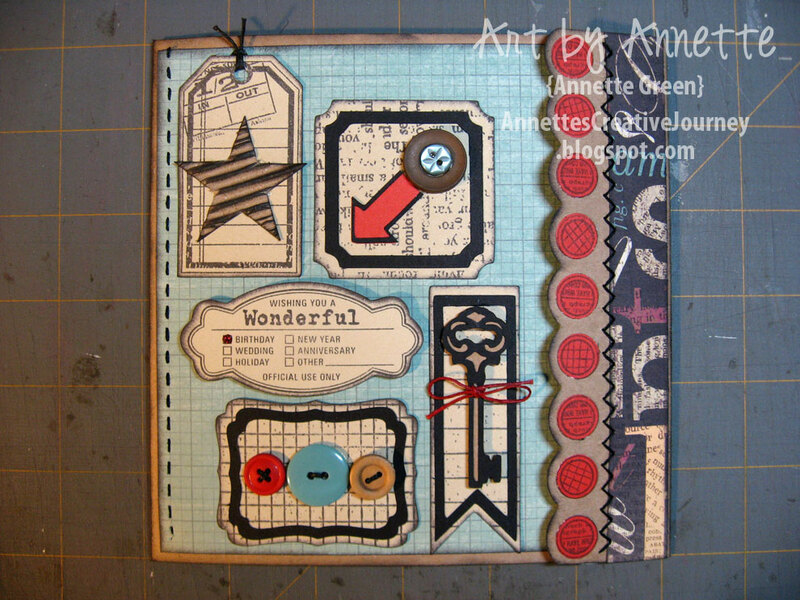 As a consultant, I find the Art Philosophy cartridge tremendously helpful in preparing projects like this because it's just a push of a button and all the pieces are cut for my guests. They love this too, obviously, since they don't have to cut around stamped images anymore. I added an adhesive-backed Velcro circle to help keep the card closed. I wish I could take credit for such perfect stitching, but I couldn't have done this without my new ruler from Close To My Heart. This clear 14-inch ruler has measurements in inches. 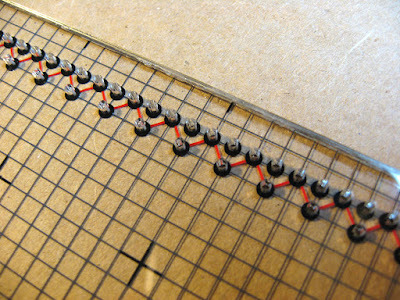 And I love the grid pattern of 1/8 inch. See the guide holes for evenly spaced stitching? 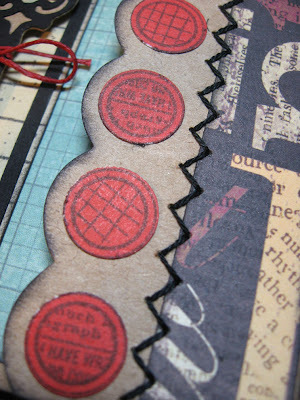 You just pierce through the holes and your paper and start stitching. 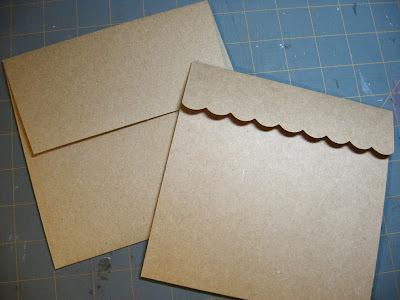 I did this with the zig-zag and the straight stitch on my card as well. The ruler also has a metal straight edge, perfect for using your craft knife so you don't hack up the plastic. 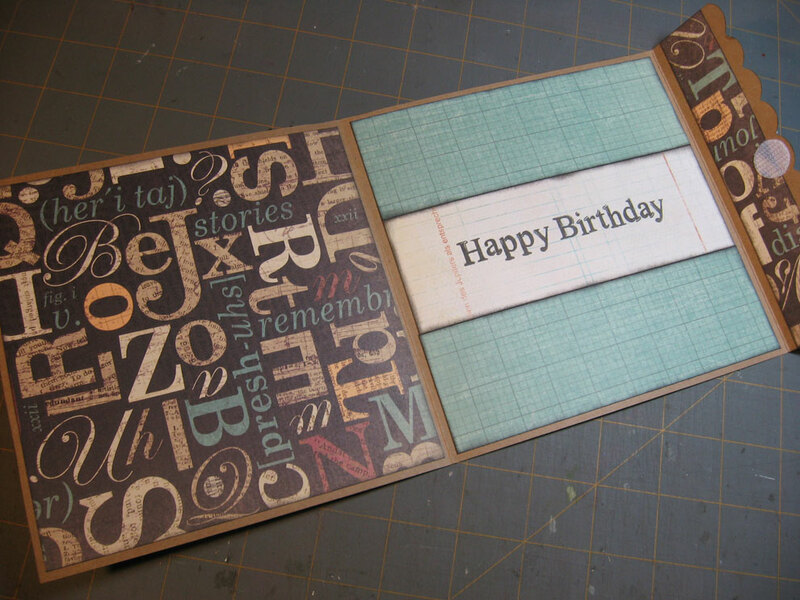 • Stamps sets: Vintage Type, Noted Backgrounds (retired), Card Chatter Birthday, Happy Birthday (retired), and one of the stamp sets from the Art Philosophy bundle. All products are from Close To My Heart which you can buy from me or your local CTMH Consultant. Thanks for looking today. Enjoy your Monday! This past Spring Break, we took a family trip to New York City. We visited the World Trade Center Memorial and construction site and took just a few pictures. 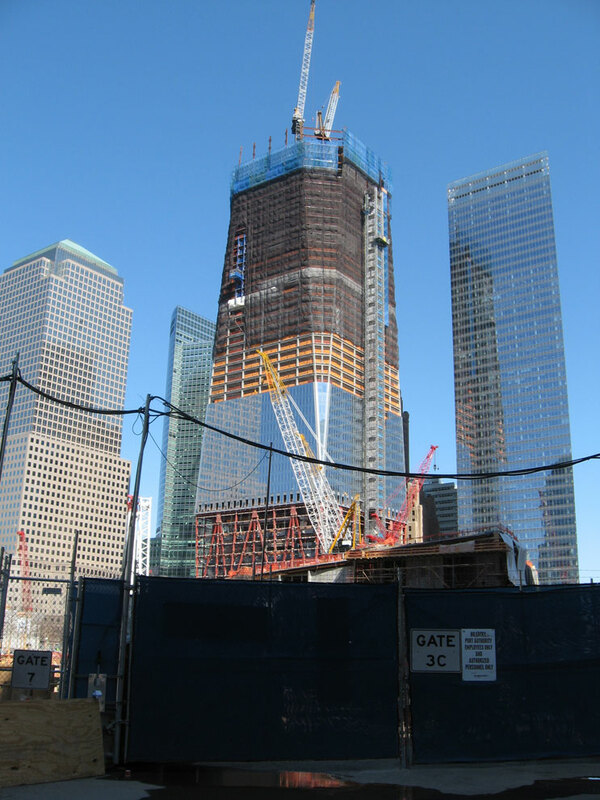 Although I didn't know anyone who was directly affected by this tragedy, I think now that we were all affected in our own way as Americans. 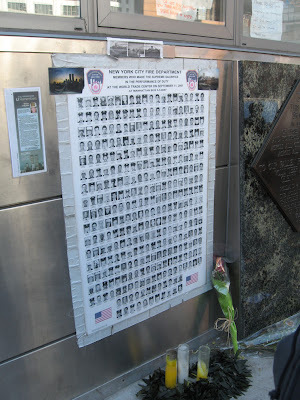 It was very emotional to be there, even after so many years. It's true "We will never forget." There are a precious few days in my monthly schedule where I can just create for fun. Where I don't have to focus on creating for a class. I can take an entire day to slowly create and play. Sometimes it doesn't always turn out so great, but at least I'm thoroughly enjoying the process. This card is a perfect example of just this. I know it's all over the place, design-wise, but I had fun with it nonetheless. Just using great products like these gives me such pleasure! Graphic 45's "The Magic of Oz" papers, Cosmo Cricut's "Circa 1934" paper and Tim Holtz stamps and dies, Jolee's Boutique stickers, plus Close To My Heart's embellishments all came together for a fun and delightfully dark Halloween card. 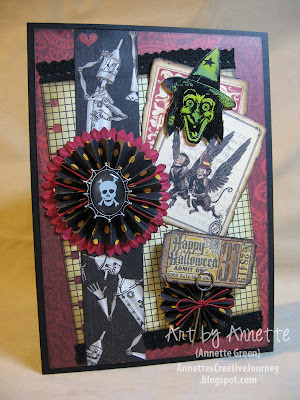 I snatched up these Jolee's Boutique Skull Cameo metal embellishments as soon as I saw them. Twelve in a pack with four different designs. 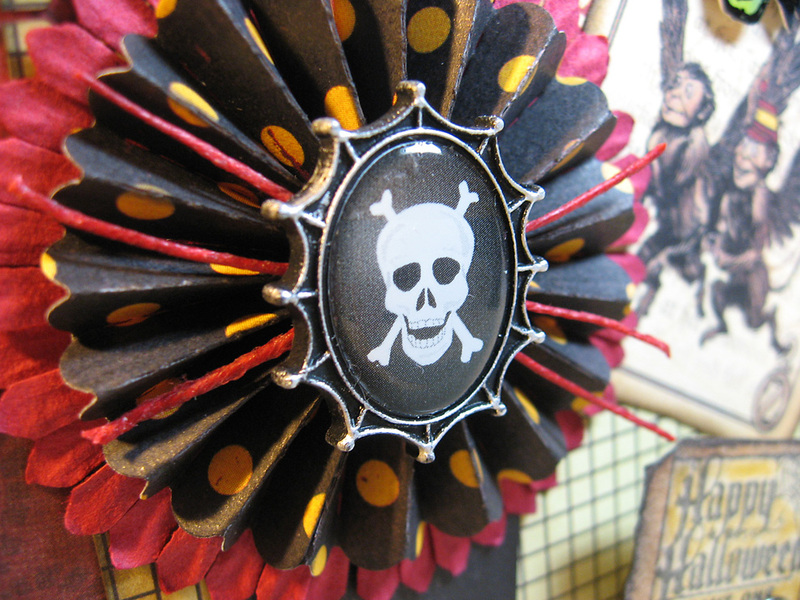 The two rosettes come from Tim Holtz Mini Paper Rosette's Alterations die. 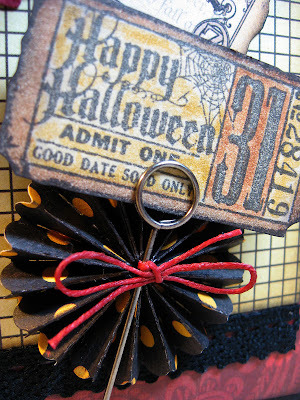 This great pin embellishment is from Close To My Heart's new Foundry Pin Clips. I tied some Cranberry Waxy Flax around it for some color. Gotta love this witch from Tim's Mini Halloween2 stamp set. 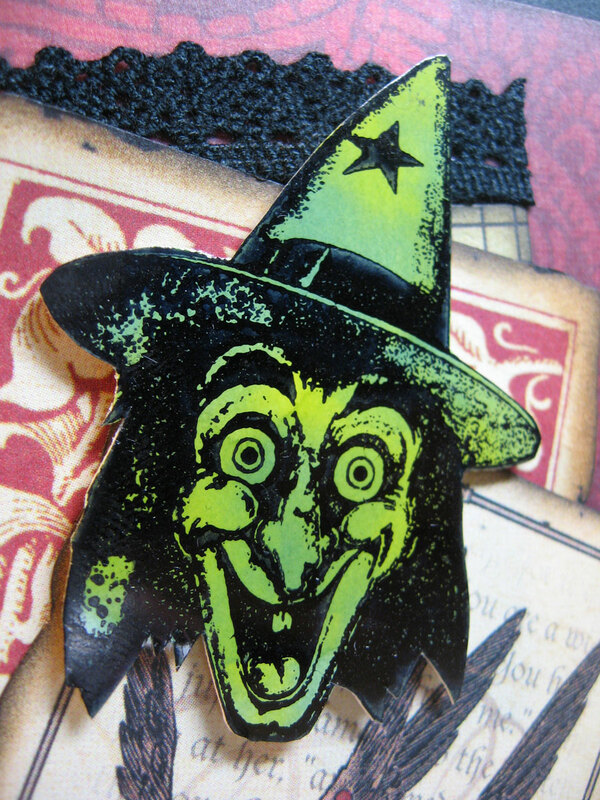 I used Glossy cardstock, three shades of green alcohol inks on a felt applicator to puddle the colors, stamped the witch with archival black over the green, then cut her out. The inside is stamped with black using Close To My Heart's August stamp of the month "Wicked" phrase. 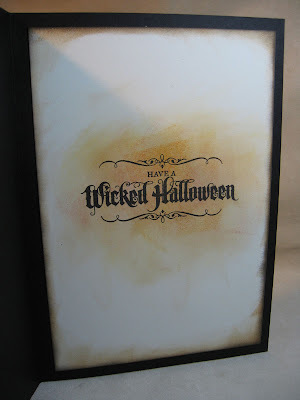 I grunged up the paper with Vintage Photo, Wild Honey and Black. 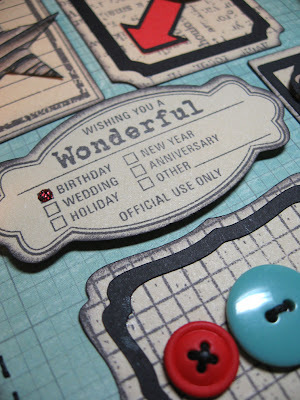 Although my design is all over the place, the key is that I enjoyed every second of creating this card. I encounter so many people in my classes and workshops who fret over every detail, every measure, and the perfection of everything. Nonsense! Just enjoy the process, I say.